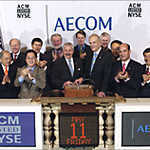 Aecom Technology Corporation is a conglomerate of management and technical support professionals. Engineering News Record says that the company ranked 2nd in terms of earning highest revenue from design projects. Technical and support management services are offered to construction, architecture and building engineering professionals. Services are also provided to transportation and water, oil and natural gas service providing industries. The company was established in the year 1990. Headquarters of the organization is in City National Bank Tower in California. At present, approximately 48,000 full time employees are working in this organization. Richard. G. Newman is the present CEO of the company. There are currently 0 consumer reviews about Aecom Technology Corporation available. Share your review. Please take a note that you are about to post a public review about Aecom Technology Corporation corporate office on CorporateOffice.com. This review will be public, so please do not post any of your personal information on this website. If you would like to contact the corporate offices of Aecom Technology Corporation, please use their contact information such as their phone number, website, and address listed above to contact them. However, sometimes staff from Aecom Technology Corporation headquarters do read the reviews on this website.